Diversity and talent management initiatives must address all employees’ needs or risk failure in achieving critical business objectives. Yet in many cases, a review of these initiatives indicates there is still much work to be done to be totally inclusive of Asian-Pacific-Americans, or APAs. For the past four years, nonprofit organization Asia Society has been reviewing how Fortune 500 companies are doing in this area and what needs to be done differently to address Asian-Pacific-Americans’ issues. (Editor’s note: The authors are affiliated with Asia Society). 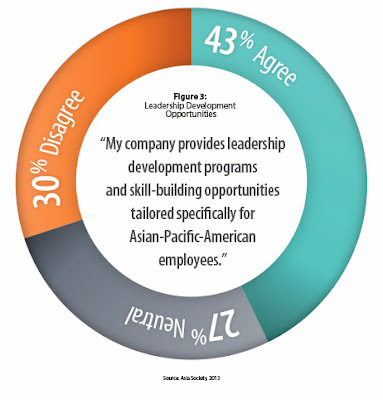 Asia Society’s 2013 Asian Pacific Americans Corporate Survey of more than 2,000 APA employees at Fortune 500 companies gauged how corporate America is engaging this segment of the population. The survey covered six key dimensions of employee engagement: diversity, professional growth, commitment to the APA community, APA market opportunities, the job itself, and overall satisfaction, commitment and belonging. The good news is a majority of APAs feel good about growth and development prospects (Figure 1). This suggests there is a foundation to build upon in terms of achieving full engagement with APAs. The bad news is for the second year in a row, more than 40 percent of APAs said they either don’t feel a sense of belonging at their company or are indifferent to the question (Figure 2). This raises a number of issues. The results of the survey suggest that diversity executives should examine why this seemingly dedicated and motivated group of workers lacks a sense of connection and acceptance in the workplace. Is this not a missed opportunity to fully engage this important constituency? What steps can be taken to make APAs not only committed to their jobs, but happy about that commitment? Addressing this issue will be significant for Fortune 500 companies. Fifty percent of the APA population over age 25 has a bachelor’s degree, and 20.7 percent has a professional degree, both nearly double the U.S. average, according to the U.S. Census Bureau. Their overall job satisfaction and engagement may be critical to U.S. business success. Yet when it comes to areas that may contribute to APAs feeling respected at work, the survey results consistently come in under 50 percent. For instance, 43 percent of APAs feel their company provides leadership development programs catered to them (Figure 3). 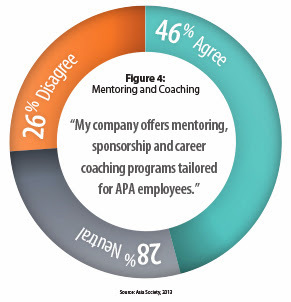 Further, 46 percent feel their company offers mentoring, sponsorship and career coaching programs for APAs, and 47 percent said their company has formal, rotational programs that include operational assignments (Figures 4 and 5). These issues must be addressed if companies are to fully engage APA employees. Of course, each company and industry has its own challenges. Embedded in this complexity are the needs of each distinct APA community. While the expectations are not dissimilar to all other employees, significant themes arise that require attention and action from corporate leaders to engender positive business results. There are ways for companies to recruit, retain, promote and leverage talented APA human capital. 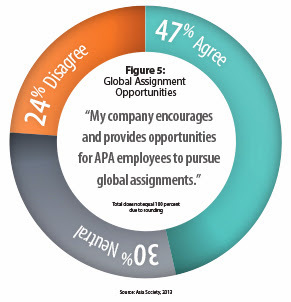 The 2013 survey results point to a few solutions that may help, such as encouraging mentorship and training opportunities for APAs, making diversity part of the organizational fabric, harnessing the optimism of the APA community, and leveraging a market in which business with Asia is growing in importance. Build APA strengths and talents. Employers must invite, encourage, train, coach and mentor APA employees to actively participate in strategic business objectives. This means providing training for APAs in the skills required to excel in corporate organizations without sacrificing values. If a style of work does not coincide with workers’ cultural or religious needs, the company should consider changing its policy to address those needs. This would demonstrate the company cares about diversity and that it wants to be inclusive. Next, companies must also develop APAs through leadership initiatives that emphasize profit and loss opportunities. In addition to prepping them for internal opportunities, development could heighten the level of trust an employee feels the company has in him or her. This goal can be sustained by promoting and supporting APAs to executive levels, where visibility fosters positive perceptions about upward career mobility companywide. The survey indicated APA employees see this as a sign the company is committed to development and to their achievement. Make diversity part of the organizational fabric. Companies should seek to review, refine and audit all initiatives, policies, procedures and activities to ensure parity and inclusivity for all employees. Often people who feel left out will not have the motivation to speak up. Therefore, companies must actively engage employees and give them an opportunity to be heard. If an employee isn’t talking, encourage him or her to share innovations. Leaders can be trained to encourage this type of involvement and to be more inclusive of APA employees. Employers also can invite employee perspectives to guide recognition and respect for diverse cultural and religious traditions and activities as part of the organizational culture. This type of engagement should be extended to non-APA employees as well so they can understand some of their peers’ cultural values. Harness the optimism. If companies understand the missed opportunity in failing to engage APA employees, there are a number of positive steps they can take to celebrate that community and show respect for it. For instance, firms can undertake outreach efforts with local, regional and national APA community-based and nonprofit organizations. They could encourage volunteerism with these organizations and enable employees to engage. Younger employees especially can connect to a culture of volunteering and engaging in activities outside the workplace. A number of best-practice organizations have used their APA employee resource groups as a vehicle for engaging external organizations. This can be critical to strengthen a company’s employer brand, which can aid engagement as well as recruiting efforts. Leverage the changing market. Asia as a region is no longer up-and-coming — it has arrived. As the world of business continues to shift from the West to the East, companies should not forget the connections many of their APA employees may have with those regions. Employers can encourage and seek out APA employees with knowledge of APA and Asian cultures and markets, and involve them in marketing strategy and business development. Companies also should be open to ideas about how they might operate differently when dealing with Asia, or be open to new ideas or markets where an APA employee may have particular insights. There is no simple recipe to address the needs of any one population. However, the need to act becomes evident with more information provided to decision-makers in an objective, statistical and logical manner. Asian-Pacific-Americans are here to contribute, and the pull for corporate entities to hear and respond to their voices is clear. Now more than ever APA employees are making it clear that coming to work is more than simply completing a task. Work is a personal dimension of APA identity, where authenticity in all things is a key driver to attract them to one company over the other. Regard for individual authenticity combined with a thirst for growth and development requires companies to foster individualized development programs. Further, policies and procedures designed to foster diversity, bringing APAs, and all employees, to address business activities, and make leadership development a priority are all key to increasing satisfaction. The Asia Society survey identifies a number of companies that are best-in-class in engaging and working with their APA employees. But even these companies are constantly looking at ways to improve their engagement and move toward a time when incorporating APAs, and all communities of diversity, will be second nature. In each of the four years Asia Society has conducted this study there have been improvements, and in next year’s survey the organization hopes to see that trend continue. But success is not guaranteed. It must come from sustained, concentrated efforts from executives and employees to engage APA employees and foster the talent, diversity and possibilities in this community. Philip Berry is the president of Philip Berry Associates and adviser to the corporate diversity council for the Asia Society. Michael G. Kulma is the executive director of global leadership initiatives at the Asia Society. They can be reached at editor@diversity-executive.com.